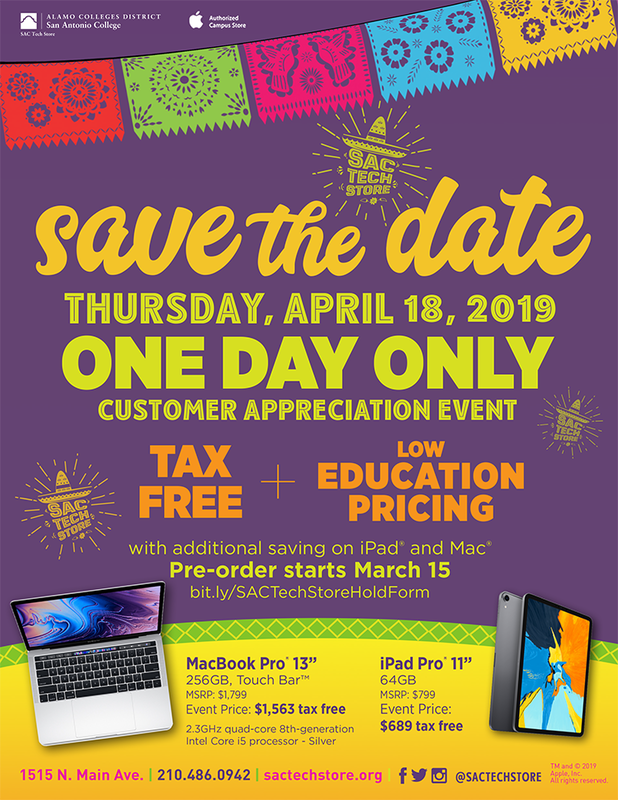 The SAC Tech Store is proud to offer its Spring Customer Appreciation one-day special pricing, plus tax free savings on Select Apple MacBook’s and iPad. In addition, all PC Devices Dell, Lenovo, Microsoft Surfaces , and accessories will be tax-free. Reserve your device now through April 12. This one-day event is open to all of Alamo Colleges faculty, staff and students. Orders can be placed online through our pre-order site (bit.ly/SACTechStoreHoldForm) or walk-ins are welcomed at the SAC Tech Store located at 1515 N. Main inside Welcome Center. Pre-orders are highly recommended. Product is available on a first-reserve, first-get basis, while supplies last. Pay in person in-store on Customer Appreciation Event on Thursday, April 17 from 8AM-5PM. The SAC Tech Store Apple Campus Store tax-free plus education pricing is good for personal purchases only. Offer not valid for departmental purchases or payment with p-card. Discount exclusive to Apple Computers or iPad may not be combined with other promotions. All sales are final.